On first application the strong scent of herbs will hit you like a brick wall. It is heavily scented, which I will admit at first put me off, as it was just so strong and it lingered for a very long time. However, the benefits of this product are so good and the effect it has on my skin makes it completely worth the unpleasant scent. Plus after a while you get use to the scent! 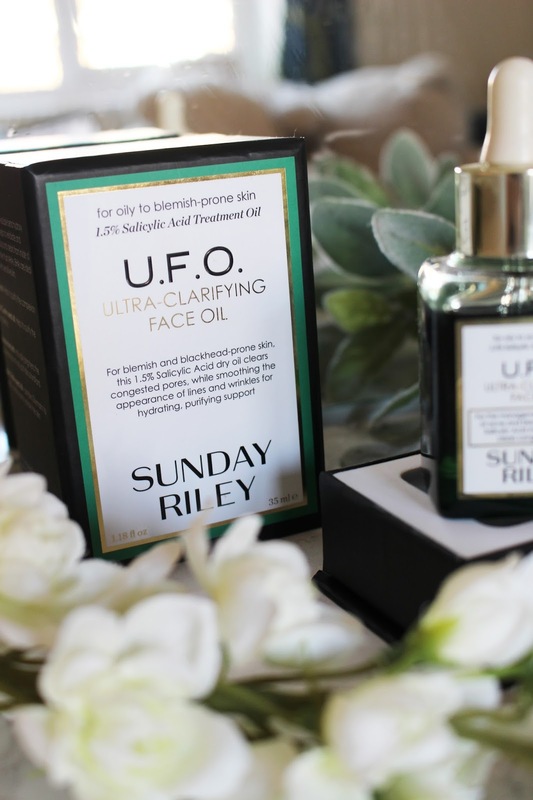 Sunday Riley, themselves, have even said that great skincare should not smell great. 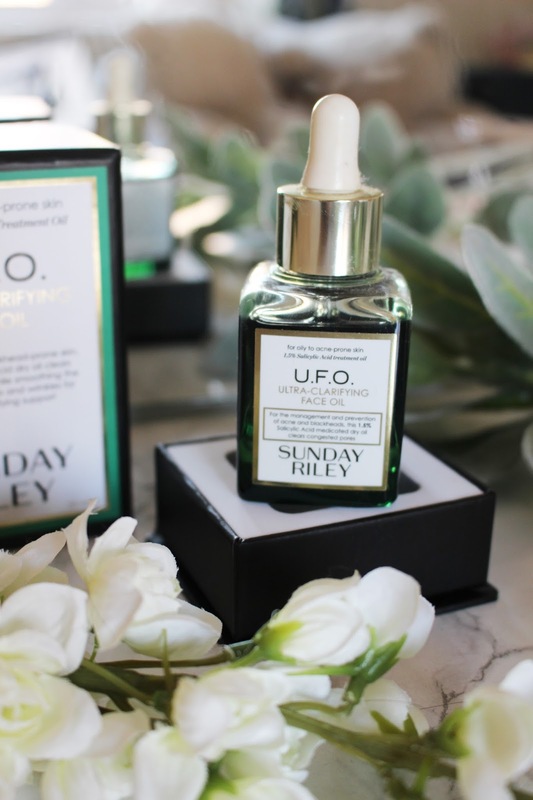 If you have been lusting over Sunday Riley products for some time, you may be aware that they like to colour their oils in bright colours and this one is green (I'm guessing because of the fact that they have named it U.F.O). So it does seem strange that you are applying a herb scented green oil to your skin but you soon get over it and it becomes a normal part of my routine. The U.F.O. Ultra-Clarifying Facial Oil helps to keep blemishes, acne and blackheads at bay with the help of salicylic acid - which is blackheads and acne's biggest enemy that penetrates pores to eliminate spot causing dirt and bacteria. You really only have to use this a couple of times a week to see an improvement in your skin's texture, clarity and tone. This product is perfect for anyone who is prone to oily skin or has problems with acne. Now usually I would not buy a product that is specifically for these skin types (as I have normal to dry skin) but I do suffer from pores and do get blemishes every now and again. I will only use this one to two times a week (and sometimes not even that). Now the reason I don't use this as much is because of the fact there is salicylic acid which is known to dry out the skin when repeatedly used, therefore I don't want to make my skin any drier than it already is. But I have found that using it once every few days is fine. I will use it for a couple of days in a row if I have some blemishes but usually I use it a couple of times a week to help clear my pores and keep any future blemishes at bay. I have been using this for the last three months and have been regularly using it twice a week for the last month and I have noticed such a big difference in how my skin looks and feels. Nothing else has really changed in my skincare routine so I know that it is this product that has worked the best at reducing blemishes. Sunday Riley U.F.O. 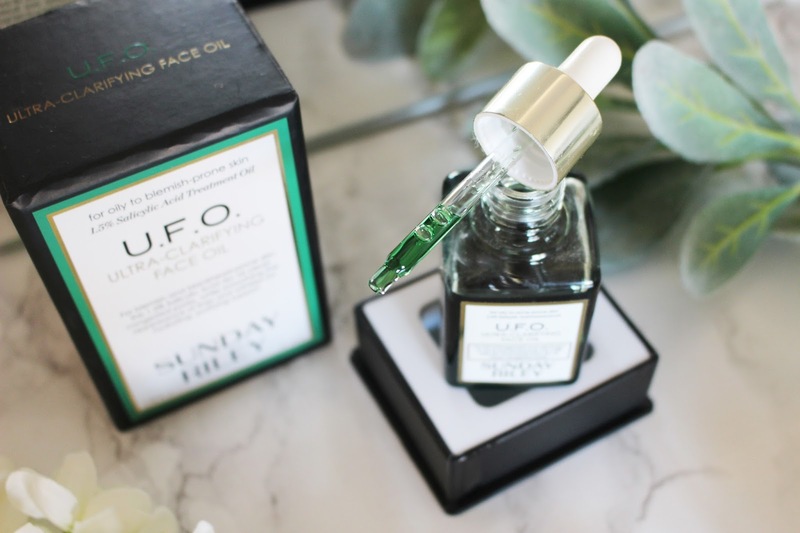 Ultra-Clarifying Facial Oil is created for oily and acne prone skin (but you can still use this with dry skin, just use it less regularly) so this will help to improve the quality of your skin as well as helping with blemishes. I have noticed that any blemishes are reduced significantly and just the quality in my skin has drastically improved. My skin feels more hydrated, looks healthier and I find that I get less blemishes now that I am using this more regularly. There is also cucumber and milk thistle in the oil which helps to maintain moisture in your skin to leave the skin feeling plump and dewy; meaning it is also great for dry skin. Because of the 1.5% salicylic acid, this is not just a facial oil but is considered a topical medicated treatment and uses something called BHAS as an exfoliator, which is meant to be less irritating that other facial oils that don't use BHAS. I really love that this had a dropper, meaning you can easily distribute the exact amount of product you need without having the worry of wasting any product (as this is an expensive skincare product). Because of the price I am trying to use this as sparingly as I can, and because I don't suffer from blemishes that often I have managed to make this last such a long time. I have used this twice a week for the last three months and have barely used any (there have been some weeks where I used it once or not at all). I find that I only have to use two to three drops each time I apply this oil, which is plenty enough to cover my entire face. I only use this at night, like any other facial oil I would use, and I apply it once I am done cleansing and toning. I have also experimented with the way that I apply this facial oil into my skin to get the best results, and the best way is to gently pat it into my skin with my finger tips. This really helps the oil sink into the skin rather than it just sitting on top; as well as allowing me to really focus on the areas where I suffer from pores and blemishes. Unlike some other facial oils, this is a dry oil, so it doesn't leave my skin feeling greasy and oily but instead the oil is soaked into my skin leaving it feeling super light on my skin and leaving it dry to the touch. Once it has dried into my skin I then use a moisturiser, like my Tatcha Water Cream (that I am absolutely obsessed with at the moment). This is perfect if you have oily skin and suffer from acne, but if you have dry skin then I would only recommend using this a couple of times a week so it doesn't dry your skin out further. 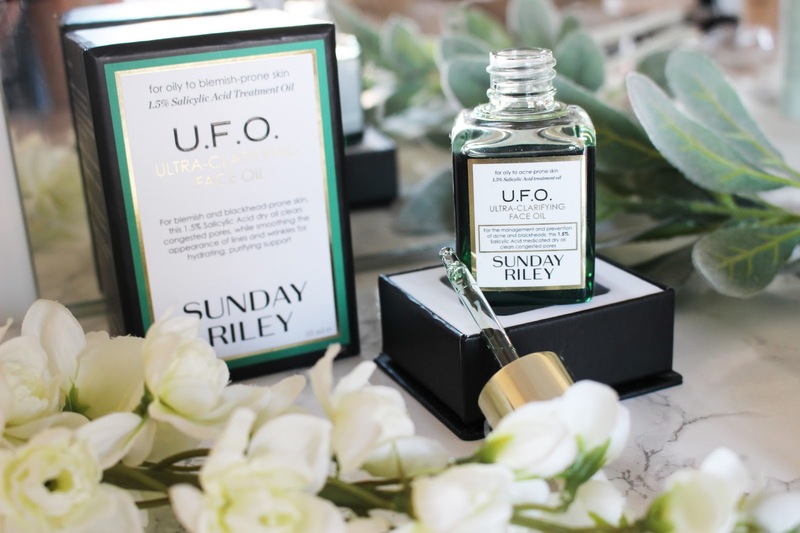 I absolutely love this product, and because of the results I have seen, I am seriously tempted to buy some other products from the Sunday Riley brand. I have never had so many compliments on my skin and it does look noticeably better; it feels more hydrated, clearer, brighter and blemishes are significantly reduced when using this product. The Sunday Riley U.F.O. 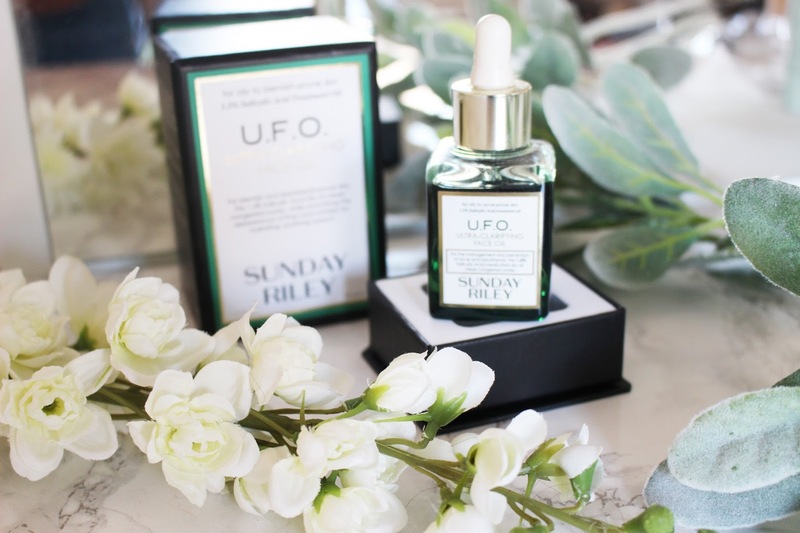 Ultra-Clarifying Facial Oil is available to buy from Cult Beauty, Harvey Nichols and Nordstrom. Have you ever tried anything from Sunday Riley? Let me know in the comments what other products I should test out from the Sunday Riley brand.